My hubby and I were at a wet market last week, and found some razor clams that were still moving! I got super excited because I miss eating them raw. When I was growing up, my dad would bring a bucket of them home, and we would eat a few of them straight from the shell. The rest of the clams were battered and fried for dinner. 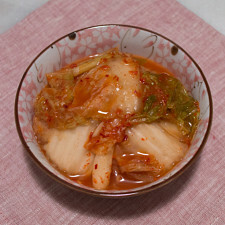 The natural sweetness from the clams got me hooked! I hadn’t eaten razor clams in years, and to suddenly happen upon them, we couldn’t say no. “Uh, so, how are we going to do this?” I asked. So off he went to his phone and we quickly decided to make ceviche that night. 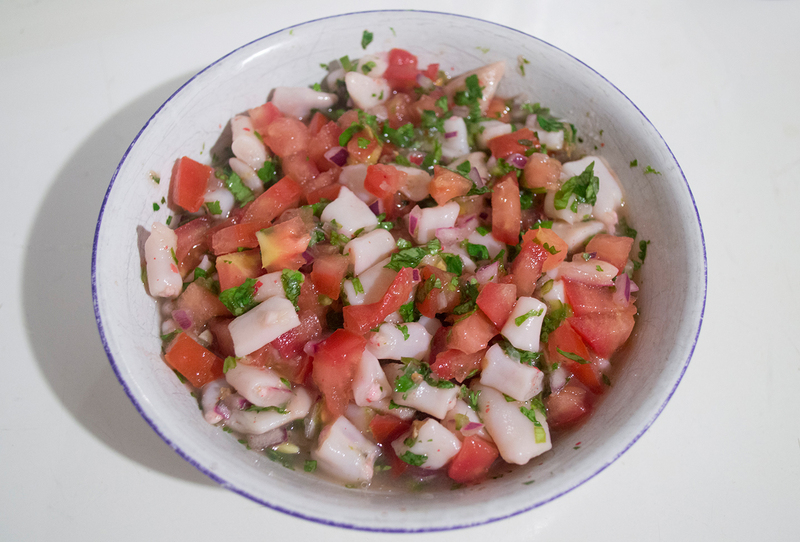 We had never made ceviche like this before, so it was really fun for both of us. He was my sous chef for the evening, helping me make the lime juice marinade. Rinse and shuck the razor clams using a paring knife. Keep only the meaty portion of each razor clam. Thoroughly clean each razor clam with cold water, then slice into edible portions. 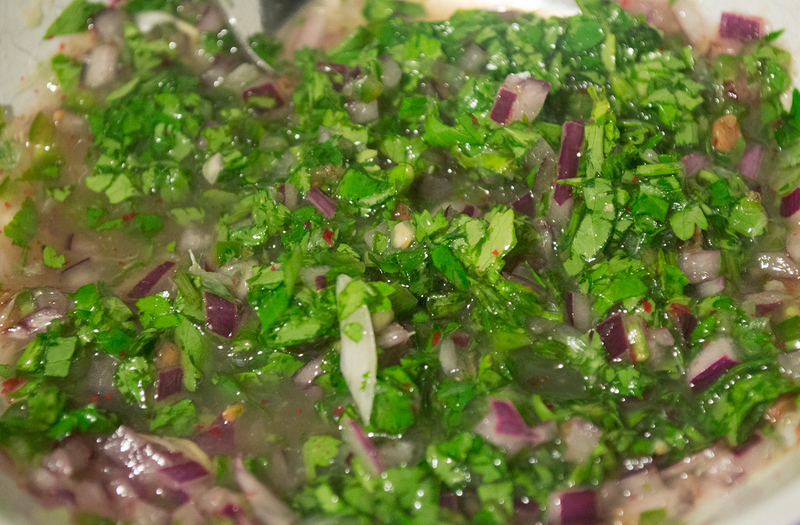 In a medium bowl, mix the lime juice, onion, olive oil, pepper, cilantro, and peppercorn. Toss the clams with the lime juice mixture. 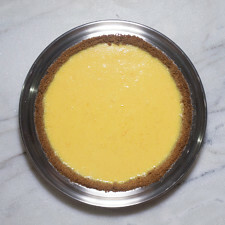 Cover and refrigerate for 1 hour. Add the sugar to the ceviche. Dice the tomato and add to the clams right before serving. Mix well, and serve cold. 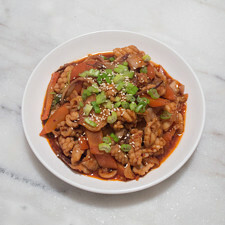 To shuck the clams, run your knife along the bottoms and tops of each clam to loosen the meat. Remove any stringy parts, sand, and the dark portions. Place them back into ice-cold water. After juicing the limes, you have the option to strain or keep the pulp. The onion, jalapeño, and cilantro are chopped and diced finely so that there is even distribution of flavors. I choose to add the tomato at the end to prevent bruising. I also remove the seeds. Use up to 4g of sugar to balance out the flavors. 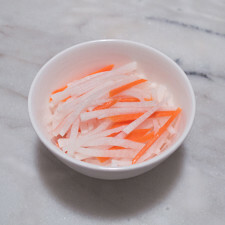 If the razor clams are naturally sweet, add less sugar. Made our Recipe for Razor Clam Ceviche? 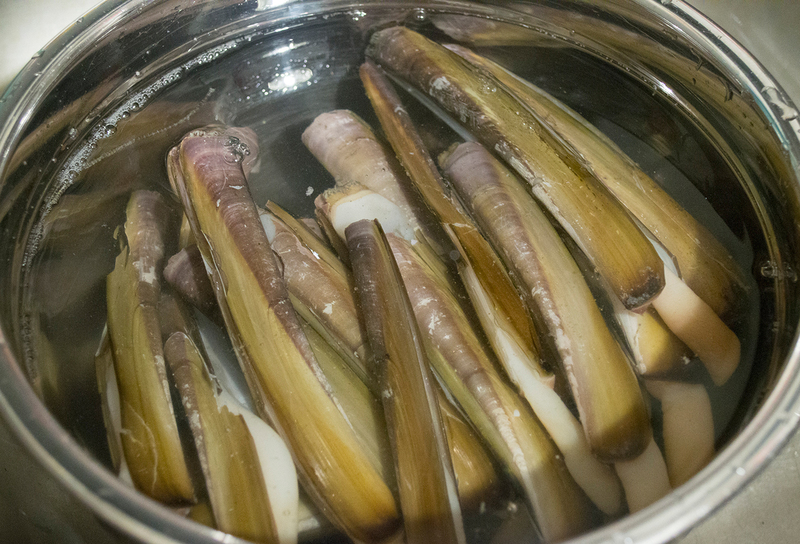 Fresh razor clams from the market: both small ones and larger ones work with this recipe. These are the smaller and thinner razor clams. The lime juice mixture before the clams and tomato. Even though, technically, these clams are jackknife clams and not the fatter — truer–, razor clams, they are equally delicious! Their Pacific coast (and Atlantic coast) cousins are bigger, juicier, and meatier (best for deep frying), but these smaller ones (better for ceviche) are more tender, and still have the same sweetness and briny flavor that all clams have. I can’t wait to get more so that I can fry some up! No thoughts on "Razor Clam Ceviche Recipe."